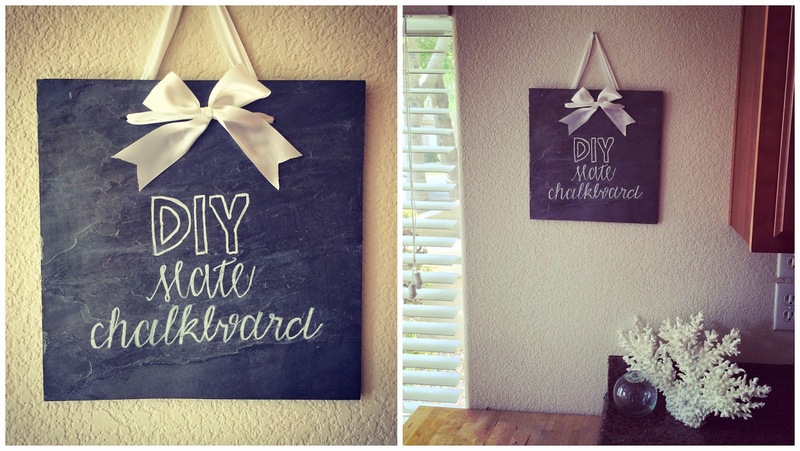 To make this DIY slate chalkboard, the total price was a whopping $1.48! I bought a piece of 12x12 slate from Home Depot (for $1.48) and already owned everything else... so basically, this DIY was a total steal! 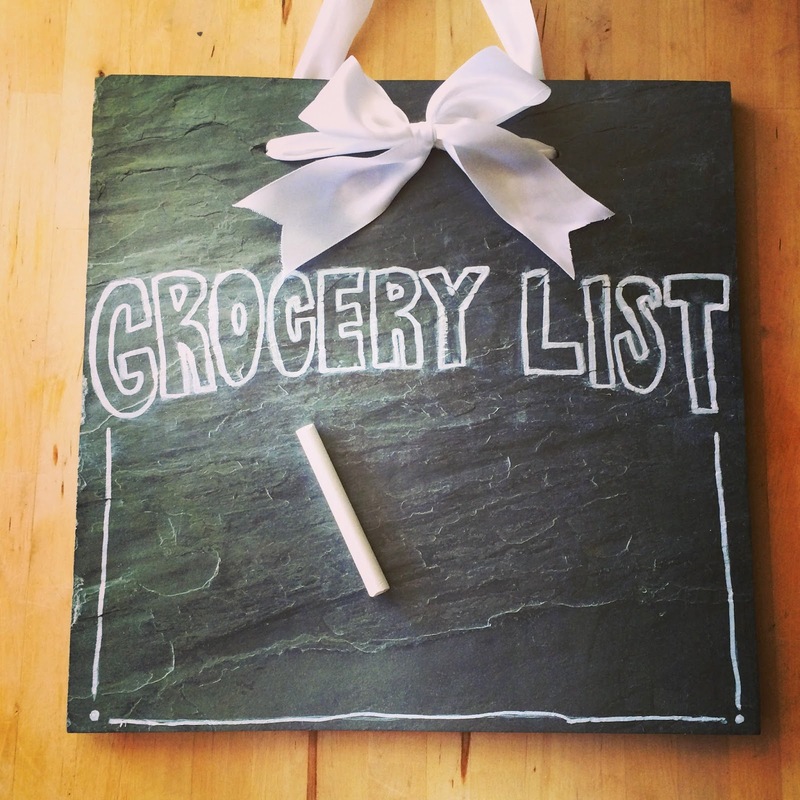 I've wanted a grocery list chalkboard for a while, and this slate tile was the perfect twist. I saw this tutorial on Pinterest, and it was so easy, so I just had to try! 1. Place masking tape on the front and back of the slate where you intend to drill holes to hang the slate. This will help the slate from cracking when drilling. 2. Mark on the masking tape where you want the holes, and begin drilling. For me, one hole was super easy and the other one required a bit of muscle when drilling... also, splash water when drilling so it doesn't heat up too much. 3. 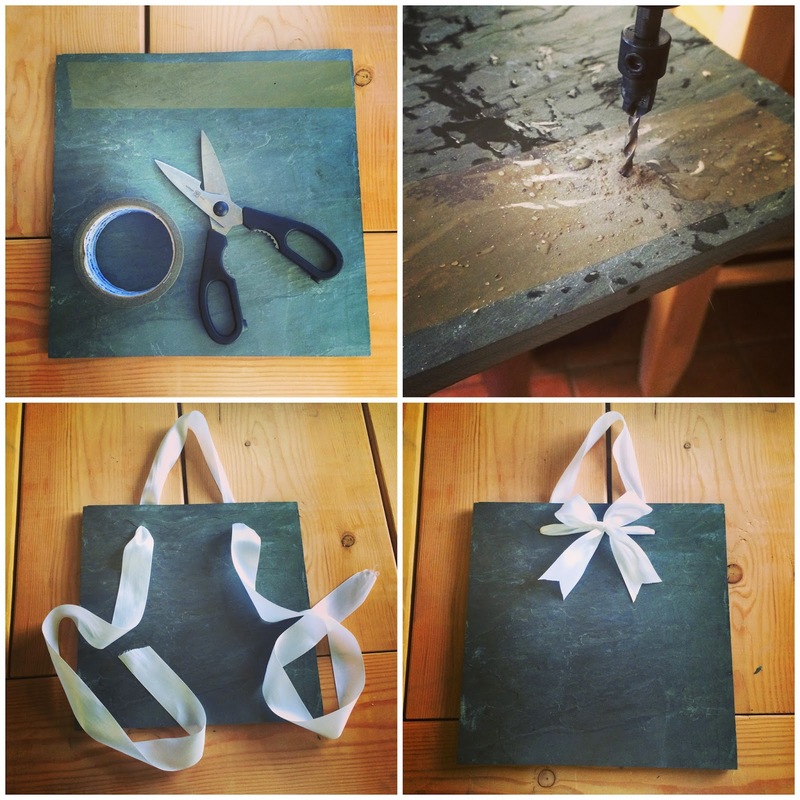 After drilling the holes in the slate, rinse the slate with water and string through the ribbon. 4. Finish by tying the ribbon in a bow in front of the slate. This chalkboard is a great way to jot down the things I need to buy as soon as I run out of something. I don't know about you, but whenever I sit down to make my grocery list I always forget 2 or 3 things since I write everything at once. Linking up for What you Wish Wednesday, Whatever Goes Wednesday, Whimsy Wednesday, Work it Wednesday, Pretty Wednesday, and Worthwhile Wednesdays. Great idea (as are all of your DIYs)!! This is super cute! I love that it's really easy to do and affordable. This is too cute! I love the bow touch, as usual! Love this with the bow, it's so cute!! Perfect size for grocery lists or a weekly menu! This is so perfect! What a fabulous idea! Awesome!!!!! Not to mention, you can totally change out the bows for holidays!! Soooo fancy!! This is so cute! And your handwriting is so good! Love this! I'm all about using the chalk board for lists and weekly menus! I'm seriously loving all your recent DIY's! Cah-ute!! You do the best DIY projects. I especially love the bow. This is so cute and I love the texture of the chalkboard! I recently just added a chalkboard wall to my craft room, so I'm pretty much obsessed with all things chalk! I've never seen slate used before... interesting. This looks so simple! Love it! So cute! Now only if I could write like that on a chalkboard....your handwriting is perfect! Love this and how simple it was to make! Very cute! You're so DIY-y Lisa! I love it. This is awesome! I made this last night. SO cute and easy!! I glued the ribbon because I had no husband around! Happy to say I have finally done a project of yours!! Loving the slate… so pretty! I feel like the ribbon makes this DIY - it's super cute! Is this any slate tile you can buy at any local home improvement store?